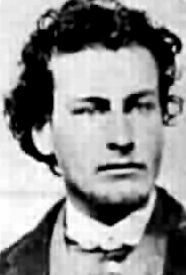 Richard M. Brewer (1850-1878) – A gunman and lawman, he worked for John Tunstall as leader of the Regulators in the New Mexico’s Lincoln County War. Born on February 19, 1850 in Franklin County, Vermont, his family moved to Wisconsin in 1854 and when the lad turned 18, he made his way west. Settling down in Lincoln County, New Mexico, he became a rancher and horse breeder. He soon befriended his neighbor John Tunstall who was in a feud with the Murphy/Dolan faction, which would soon lead to the Lincoln County War. By March 1, 1878, when the rivalry had grown to gunplay, Brewer was appointed constable by the Magistrate. His group, known as “The Regulators,” included Billy the Kid and other deputies. Their purpose was to serve arrest warrants to members of the Dolan Gang for the ambush and murder of John Tunstall. On April 4, 1878, Brewer led the Regulators to Blazer’s Mill where they were confronted by one of the men they held a warrant for – Buckshot Roberts. Soon, the guns blazed and two Regulators were wounded and one killed – namely Constable Brewer. Buckshot Roberts was also killed and the two were buried side by side. The Historical Marker for Richard M. Brewer located in Boaz, Wisconsin says his family arrived to the area in 1854. Thanks David! I’ve corrected the article.